One of the most valued and interesting pieces in the Tread of Pioneers Museum�s collection is a very ordinary looking wooden gavel. 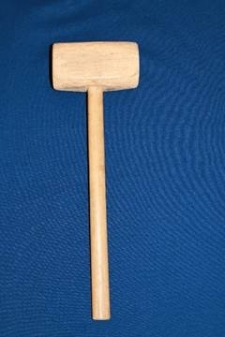 The gavel was used by town founder James H. Crawford at the annual Routt County Pioneer Association meetings. Crawford, who established the town of Steamboat Springs in 1875 (among many other things) was also the first president of the Routt County Pioneer Association, which he helped to form in 1903. During the Association�s annual meetings, pioneers from across the county, (which in 1903 also included Moffat County--the two counties were divided in 1911) would gather each year, nominate officers, discuss the happenings, listen to friends tell stories about those early days in Routt County, and of course eat lots of food. But before it was a gavel, it was a flag pole. As the story goes, it was the summer of 1875 and the Crawford family planned to fly the first flag in Steamboat Springs. A pine tree was cut down, bark removed, and smoothed into a fine flag pole. At this time, there were very few white settlers in the Yampa Valley, and the Native Americans who inhabited the valley in the summers, the Utes, were very interested in what this family was up to. Stories from the Crawfords indicate that the Utes and Crawfords were friendly, and Crawford and Ute children played together. The Utes were present at the flag flying ceremony and witnessed the trouble Mr. Crawford had when trying to raise the flag up the pole. The large (37 star) flag got kinked half way up the pole and wouldn�t go up or down. The whole ceremony was about to be abandoned when Chief Yarmonite called to his nephew, Pahwinta, to climb up the slick pole and fix the flag. Pahwinta easily shimmied up the pole to fix the kink and the flag flew. Everyone was proud. Years later, the flag pole was cut down and a small bit saved to be made into the gavel. After serving the Pioneers, the gavel was then donated to the Tread of Pioneers Museum in 1959 (the year of its founding) by James H. Crawford�s granddaughters, Lulita and Margaret. Join me each month for more interesting stories about the museum�s treasures. Next month, the mystery behind a single gold tooth from Hahns Peak!